Vapers who choose "cherry" as their electronic cigarette flavor of choice inhale higher levels of the chemical benzaldehyde than those who choose other flavors, researchers report. Benzaldehyde is widely used as a food flavoring and in cosmetics. The aromatic aldehyde has been shown to have little or no toxicity when ingested or applied to the skin, but there is some evidence linking inhaled occupational benzaldehyde to irritation of the eyes and respiratory passages, researcher Maciej Goniewicz, PhD, of Roswell Park Cancer Institute, Buffalo, N.Y., told MedPage Today. When Goniewicz and colleagues measured benzaldehyde levels in the aerosol produced from close to 150 e-cigarette products purchased online, they found the chemical compound in 108 products, with the highest levels found in cherry-flavored e-cigarettes. The study appeared Thursday in the journal Thorax. Goniewicz said it is not clear if benzaldehyde, or other chemical compounds used as flavorings in e-cigarettes, poses a health risk to users. "We need to do the research to understand if these chemicals are safe for inhalation," he said. "Some people who vape may take 100 or 200 puffs every day for a decade or more. There may be no health consequences, but we don't really know this." The researchers measured benzaldehyde levels in 145 different e-cigarette products in a variety of flavors, including berry/tropical fruit (40), tobacco (37), alcohol (15), chocolate/sweet (11), coffee/tea (11), mint/menthol (10), cherry (10), and other (10). Aerosol vapor was generated using an automatic smoking simulator. For each experiment, 30 puffs were taken from each e-cigarette in two series of 15 puffs, with a 5 minute interval between series. Benzaldehyde from the aerosol was trapped on sorbent tubes, extracted, and analyzed using high-performance liquid chromatography. "The benzaldehyde doses inhaled with 30 puffs from flavored e-cigarettes were often higher than doses inhaled from conventional cigarettes," the researchers wrote. They added that while the benzaldehyde yields in aerosol generated from the cherry-flavored nicotine solutions were significantly higher than those recorded in noncherry flavored solutions, levels in the cherry-flavored products were still more than 1,000 times lower than doses inhaled in the occupational exposure study. 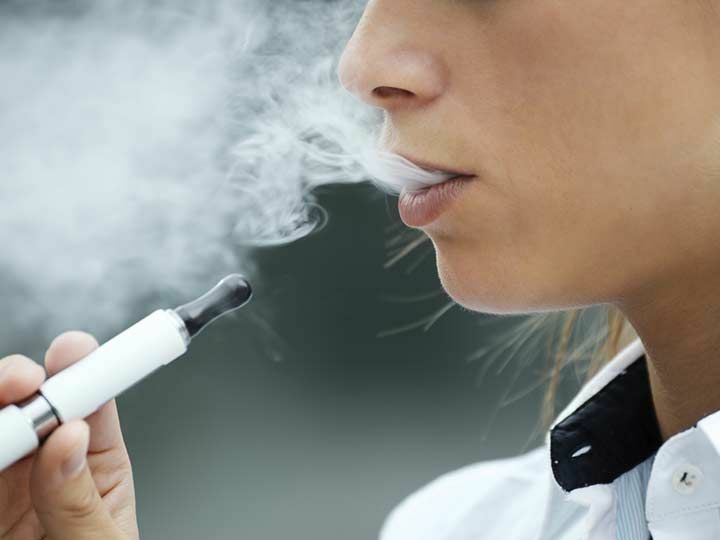 "Although e-cigarettes may be a promising harm reduction tool for smokers, findings indicate that using these products could result in repeated inhalation of benzaldehyde, with long-term users risking regular exposure to the substance," the researchers wrote. "Given the uncertainty surrounding adverse health effects stemming from long-term inhalation of flavoring ingredients such as benzaldehyde, patients should be asked about use of flavored products, particularly patients with respiratory diseases." Goniewicz added that regular vapers who experience side effects like cough, throat irritation, or dry throat may want to consider changing their e-cigarette flavor.